To celebrate Nobanno, or the new harvest season, we made a Bengali-style crepe called Pati Shapta. My parents remember eating this on days when the weather was cool and the days short, at the end of Poush, the winter month. They were feeling sentimental, so they showed me their recipe for making it. I knew that making crepes would be kind of difficult because the batter can stick to the pan, so I was lucky that I actually had crepe pans lying around the house. In the end, it turned out to be easier than I thought, and we ended up being able to enjoy it for dessert. We ate it warm, right off the pan, but it can be eaten either hot or cold. To make the filling, put the grated coconut powder in a heavy bottom pan, add khoa, jaggery, cardamom powder, milk and mix together. After turning on the stove, slowly heat the pan and stir the mixture constantly. You may have to add more milk if the mixture becomes too thick. When the mixture reaches the right consistency, remove it from the heat and set aside. 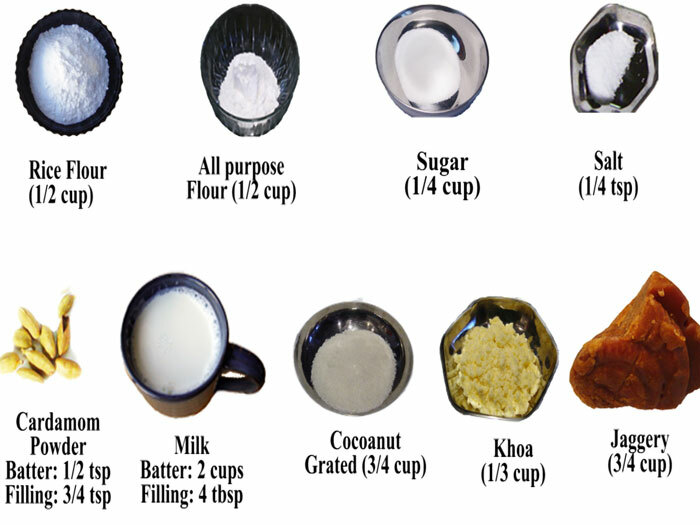 In a separate bowl add rice flour, all-purpose flour, sugar, salt, cardamom powder and mix together. Make a thin liquid, even batter. Heat a non-stick frying pan over low heat, add several drops of ghee or clarified butter. Pour one ladle full of batter in the middle and let the batter spread. Let the crepe cook for about a minute or so. Place about 2 tablespoons of filling on one edge of the crepe and carefully roll it into a tube. Press the crepe gently for the filling to spread out. Allow some time on the frying pan to give the sides a burnt look. Do the same with the remaining batter and filling. That’s it. It takes about an hour and makes around 8 to 10 pati septas. 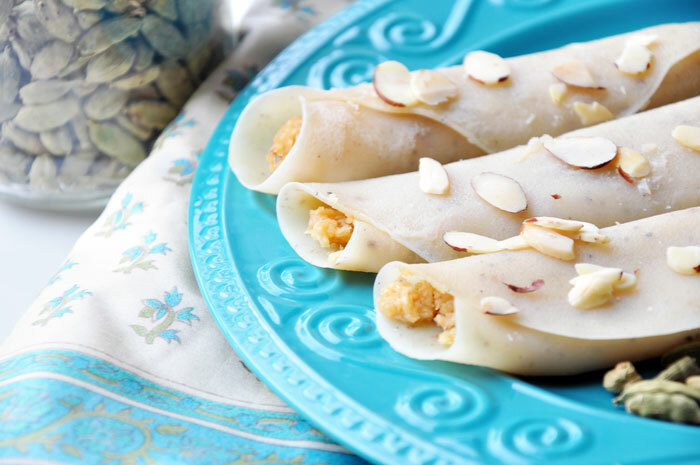 Garnish them with toasted sliced almonds before serving.